This is the 2nd of 3 interior transom windows for a beautiful farm home SW of Olds Alberta. 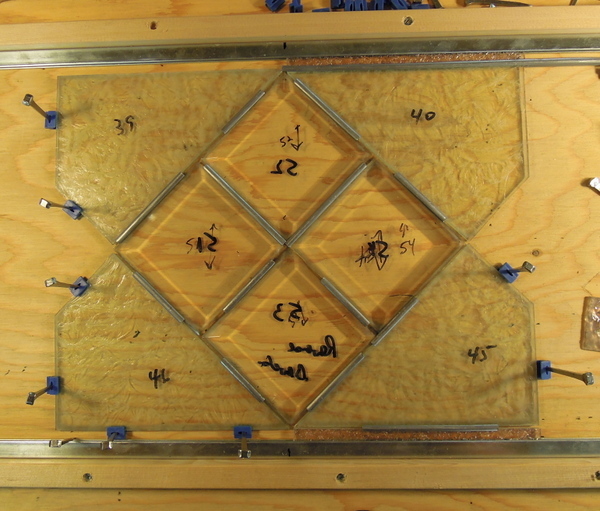 The window measures 36 inches wide by 12 inches high. 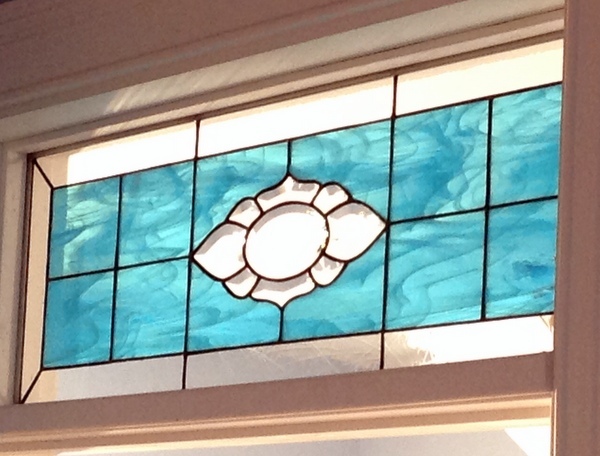 Surrounding the bevel cluster is matching Spectrum’s Sky Blue Wispy with a clear Spectrum Artique border. 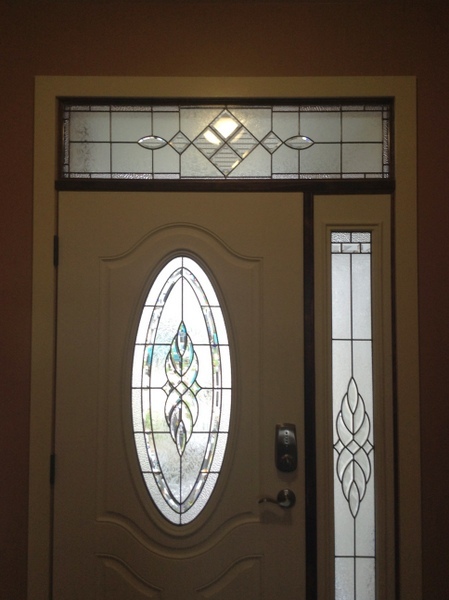 Our clients were very pleased with this great looking interior transom window. 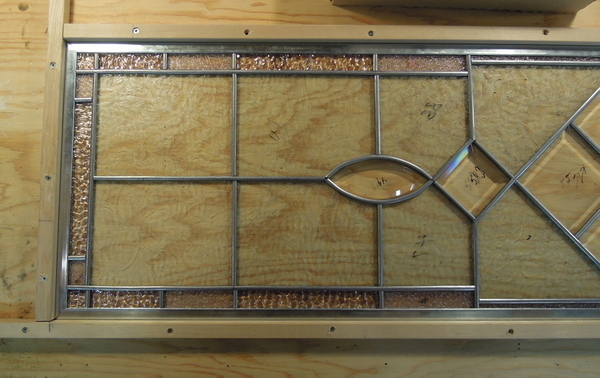 We designed this window and after centering the bevel cluster we made a border with Spectrum’s clear Artique Glass. 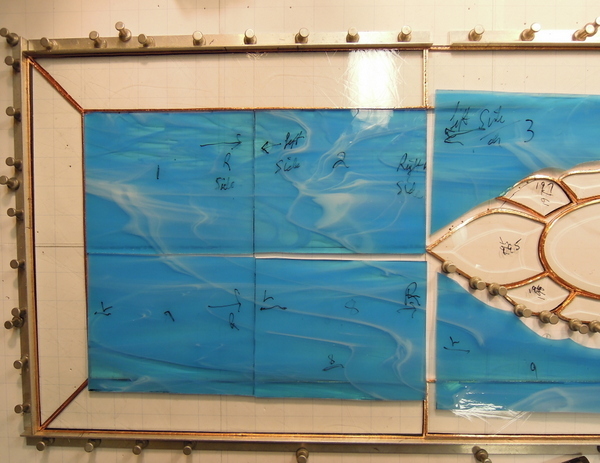 The next series of 3 pictures shows how we laid out Spectrum’s Sky Blue Wispy Glass. We were fortunate enough to obtain 2 sheets of this glass that we were able to match across the whole width of the window. This first picture shows the left hand side. This next photo shows the centre portion surrounding the bevel cluster. 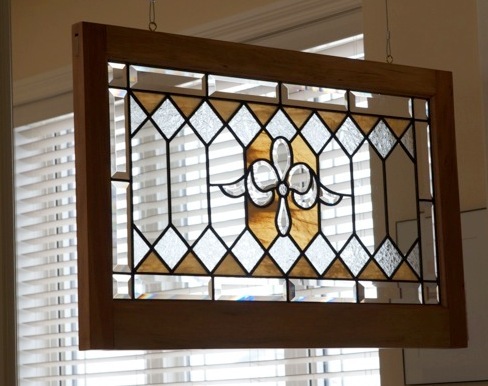 As we fitted each piece we had to make sure that the matching continued across the window. After the panel was soldered and cleaned, we then applied black patina to the solder lines, then cleaned once again with Kwik Clean, and then applied polish. After much polishing one can see the wonders of light that are seen through bevels. 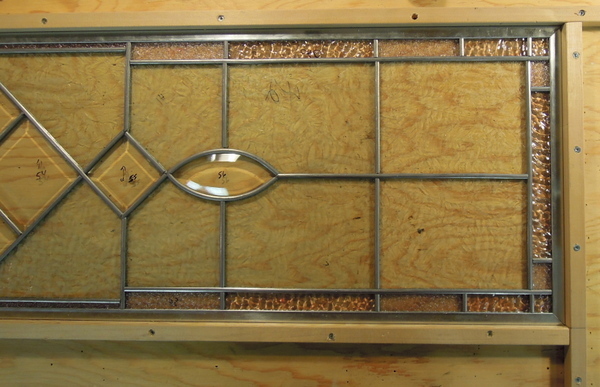 We were commissioned to make 3 interior transom windows for a farm home in Central Alberta. 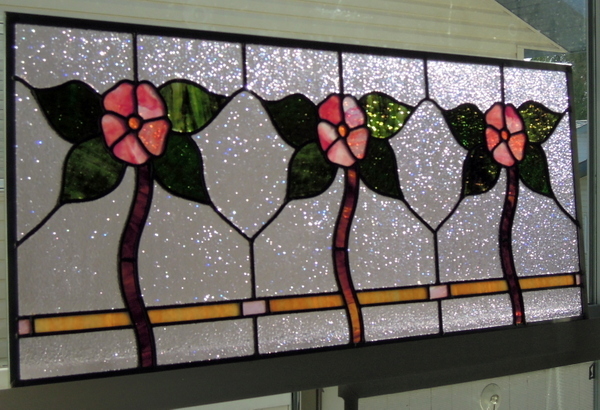 The following photos will take you from initial design ideas, construction, completion and installation of the first window which featured 3 Alberta Roses. These windows measure approximately 3 feet wide by 1 foot high. The first photo shows the beginning of our initial design idea. 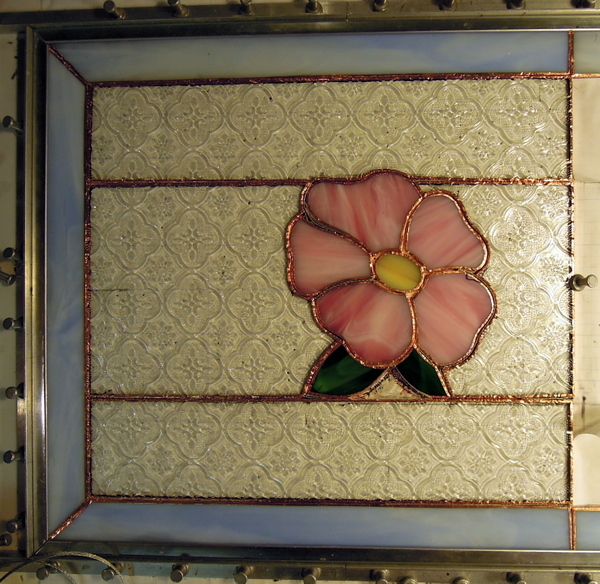 After client approval of the Alberta Roses, border design and interior glass we first started with the Alberta Roses and the border. The following picture shows the left side, we used Spectrum’s Pearl Opal #603-81CC Blue Skies for the border, Spectrum’s 609.8 Clear White Pink Wispy for the Roses, with #6067-83CC Mimosa Pearl Opal for the rose centres and #329.6 Dark Green Swirled with White Wispy for the rose leaves. The surrounding glass was an architectural clear texture glass called Morisco, which poised lots of fun problems in lining up the texture to match. 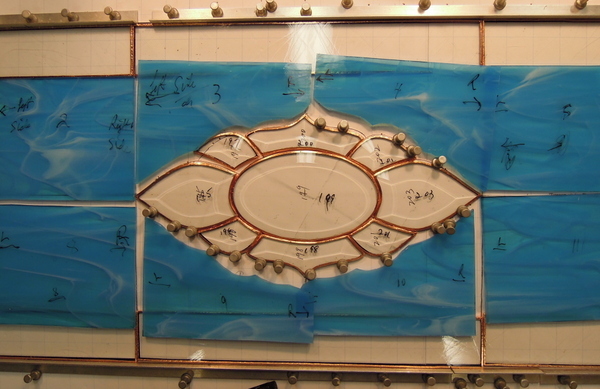 In the next picture the panel is now ready for soldering. 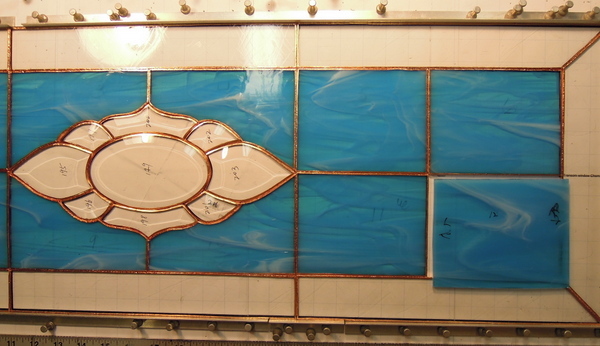 The next photo shows the window soldered and ready for patina. 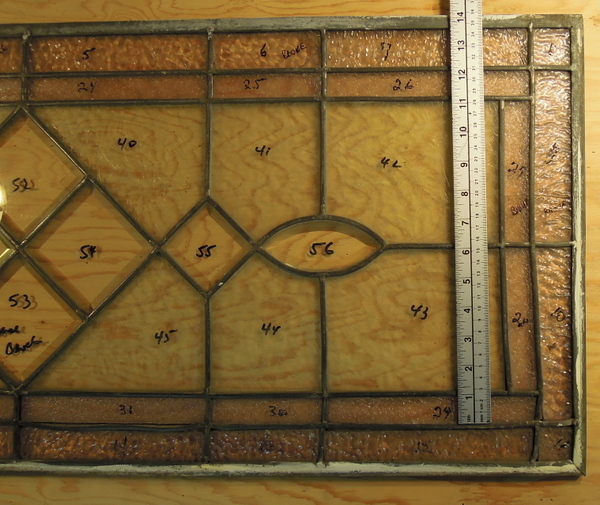 Once we have soldered a window and have applied patina we then construct and attached a 1/2 inch zinc came frame which we do not patina. We ensure that the solder joints in the window are attached both front and back to the zinc frame with cleaning and patina touch ups of these joints. 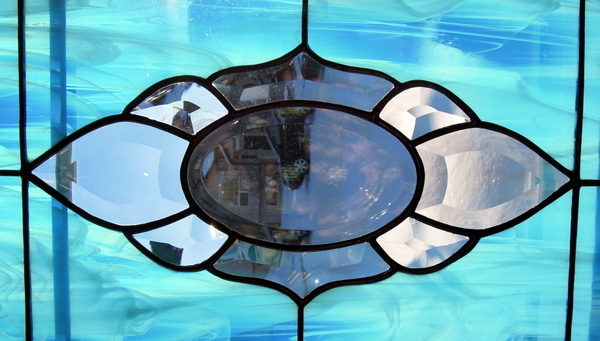 Once completed then the window is polished and thoroughly cleaned. 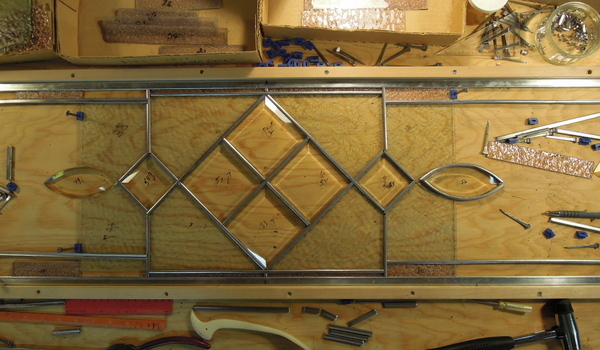 Here is the completed window. Our clients were most pleased and installed the window later on the day it was delivered to them, this picture was taken from the reverse side as they wanted to have the front facing into their daughters bedroom as she loves Alberta Roses.